Vitamix 750 Review - Is it still a Top Blender in 2019 ? The Vitamix 750 Professional Series blender is part of Vitamix’s top of the line Next-Gen(aka G-series) and has been extremely popular since its introduction 5 years ago. With many different Vitamix models including the new Ascent product line, it can be confusing comparing the 750 to other Vitamix models. 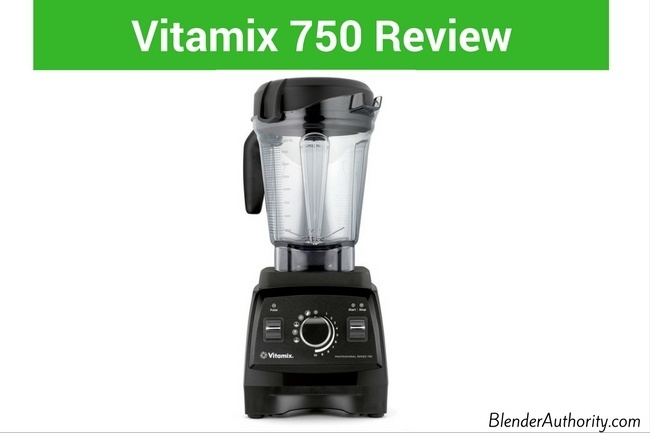 In this Vitamix 750 review I will analyze its features, performance, and compare it to the rest of the Vitamix blender line. Let’s get started ! The Vitamix Pro 750 is part of the G-series, Vitamix’s blender line that debuted in 2013. The G-series is an improvement over the company’s previous C series blenders, both in terms of features and performance. G series innovations include a new 2.2 horsepower motor and airflow design that provides performance improvement while producing less noise than their predecessors. While not visible, the new cooling fan and thermal protector will allow you to run the blender longer without overheating the motor. The most noticeable design difference with G series blenders is the new shorter yet wider 64oz low-profile containers. The low profile containers allow you to fit the blender under a kitchen cabinet which was an issue with “classic” tall container. Other positives are the G-series tamper tool is easier to use and the wider container is easier to clean. The Vitamix 750 offers a nice balance of both presets and a variable speed control for manual blending. The 750 blender comes with: 2.2 HP blender, 64oz low profile pitcher with low profile tamper, cookbook with recipes designed for 750 presets, getting started guide, and DVD. The Motor: The Vitamix 750 uses their new 2.2 Horsepower motor which is extremely powerful for a home blender. The new motor is designed to work with the wide base jars that have a longer 4 inch blade compared to the 3 inch blade on their traditional tall containers. It can easily blend ice, nuts, or hard vegetables, so basically it can handle anything that many consumer blenders would struggle with. Power settings and other functions: The 750 has variable speed settings from 1 to 10, along with a pulse button that is useful for food prep or moving ingredients around during blending. Overall, the 750 provides a nice mix of manual and hand offs controls for those that want both. Stop and Go and Preset Functions: There is a start/stop lever that can turn off the blades almost instantly. The preset buttons are for smoothies, frozen desserts, soups, and purees. On top of that, there is a cleaning preset button that is very nice since the containers are not dishwasher safe. SIDE NOTE: The preset functions don’t adjust for the amount of ingredients you are using so it will blend the same time frame whether you are blending 2 cups or 4 cups. The Vitamix 750 can perform traditional blender functions with ease. It makes smoothies quickly and effortlessly, can handle hot soups, and make puree in a matter of seconds. It really excels when it comes to handling frozen ingredients and the similar base model 7500(same as 750 but without presets) is our favorite blender for ice. Also the wider jar is really nice for making nut butters and food prep because the ingredients have more space and the longer blades provide more contact with the food. QUICK TIP – The powerful motor and wider jar allow you to spend less time preparing ingredients for blending. You can just throw in large pieces including hard raw vegetables like whole carrots. The video below shows you how to use the 750 Pro for making fruit smoothies, chicken potato soup, berry sorbet, salsa, tomato sauce, vinaigrette dressing, peanut butter, grating cheese, and how to clean the Vitamix 750 using the preset clean program. Positives: The Vitamix 750 is like having a commercial blender at home. At more than 2 horsepower, the motor is powerful and efficient, speeding up the blades to 270mph at 37,000 RPMs. The new G-series design is slightly quieter than prior Vitamix models. The controls are easy to handle and it makes an excellent choice if you want presets. Consumer Reports chose the Vitamix Professional 750 as their top pick this year after extensive tests. (It slightly beat the ever-popular Vitamix 5200 because the 750 excelled at crushing ice due to the new low-profile wide pitcher). User reviews are very strong for this blender and it is one of out top smoothie blender choices. Negatives: There are a few minor negatives to mention. First off, the new G-series low profile jar doesn’t do well blending small batches because of the wider base. Some users end up buying another container like the 32oz to handle small batches. Also, the presets on the G series blenders don’t account for the amount of ingredients you are blending so it might over or under blend if you aren’t following a specific recipe. The jar and blade is not dishwasher safe but it isn’t an issue because the Pro 750 has cleaning preset function. Overall Opinion: The 750 has many positives and is a proven workhorse with rave reviews. We really like the basic G-series 7500 and the 750 is a nice upgrade to the 7500 if you want preset controls. You really can’t go wrong with the 750 as it will last a long time and handle any task you throw at it. The negatives are very minor on this blender. 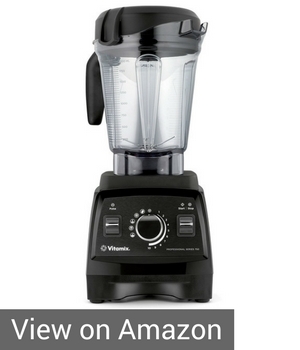 The only other consider is if you want the 750 or a new Vitamix Ascent blender(see comparison below). The Vitamix 750 and the 780 are essentially the same blender with one exception, the touchscreen. The 780 has a digital touch screen, but otherwise the 750 is virtually identical in all aspects. 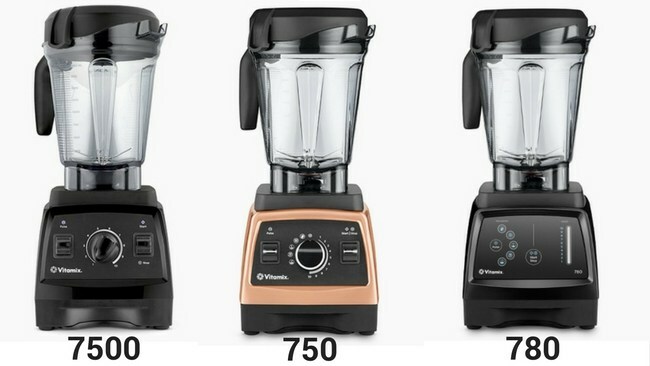 The 750 and 7500 are the same blender but the Vitamix 750 includes 5 pre-programmed settings. Also, only the Pro 750 adds the color choices of brushed stainless steel or copper metal finish. See our detailed Vitamix 7500 review for more information. The 5200 has been most popular traditional Vitamix blenders for many years. The 5200 is the most well tested and top rated blender in comparison tests. The performance in the 5200 vs 750 is similar but the advantages of the 750 are the new motor with cooling system, preset functions, and some people love the new low profile jars. The advantage of the low profile jar is that it can handle thick ingredients and food prep well because the ingredients have more space to move around. The advantage of the 5200 is the lower price and the traditional tall jars can handle small batches better than the new low profile jars. Overall both are good blenders with similar performance and same warranty. Get the 750 if you want the new design, low profile container, and features like presets. The 6500 is sort of a hybrid in that it is built on the older “C” series blender base but uses the new 2.2hp G series motor. Therefore, the 6500 looks like a classic “C” series Vitamix but it has the new low profile container. Besides the sleeker look, the Vitamix 750 has two extra preset options and is quieter. The Vitamix 300 is essentially the same blender as the 750 but with minor differences. The main differences in the 300 vs 750 is the Vitamix 750 has preset controls and a different cookbook with recipes that work with the preset controls. Ascent blenders are the new line from Vitamix with the latest technology features. The Ascent models have a longer 10 year warranty vs Vitamix 750 7-year warranty. The performance is similar with the Ascent vs G-series blenders and the 750 is most similar to the Ascent A2500 model which has 3 presets but no digital touch pad. The Ascent has a sleeker look and similar size to the 750. The Ascent blenders only work with the new smart detect jars whereas the 750 works with Vitamix legacy blender jars. Which is better (750 or Ascent) ? If you want the latest features then the Ascent 2500 is a good choice. If you want to avoid having more technology(and potential for breakage) then stick with the Pro 750. If you want to use any of the older Vitamix jars then go with the 750. If you are new to Vitamix then going with the Ascent and using the new Self Detect jars is probably a good idea since they seem to be focused on expanding the “Smart Detect” accessory line. Although, the 750 continues to be a top seller. A big selling point of the Ascent is that the A2500 costs less than the 750 and has a longer warranty. A: Yes definitely. The motor provides enough power to create a creamy nut butter with just raw nuts(no oil added) in a couple minutes. Just pour the nuts in and use the tamper with variable speed. A: The Heritage 750 is part of Vitamix’s “Heritage Collection” and it just means you have a real metal shell on the motor base rather than plastic. The choices are brushed stainless steel or copper metal finish. Other than the metal finish, the 750 Heritage is the same as the 750. A: The 750 is capable of dry blending even the toughest grains, but the recommended amount is about one cup of ingredients at a time. Also, there is a specially designed 32oz “dry grains” container with a unique blade to make grinding grains even easier. A: You will receive a 64oz container with the blender and the other choices (at an extra cost) are 48oz container, 32oz container, and 32oz dry grains container. The Vitamix 750 is one of the best blenders on the market and really offers amazing performance for home use. The Vitamix 750 can truly handle any task and is a very popular model among active Vitamix users. It is a good choice for users who like having presets as well as manual controls and the new low profile container offers some nice advantages. Visit Amazon to read more user reviews about the 750. 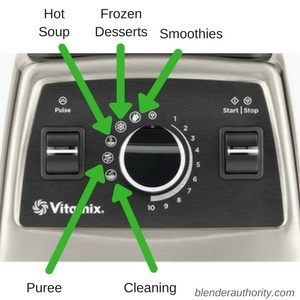 –> Also, check out our comprehensive guide to Vitamix blenders. Why does the Pro 750 cost more than the Ascent 2500 ? If the Ascent 2500 is considered to be at least comparable plus it has the added features of smart technology and dishwasher safe containers, would the Ascent 2500 be expected to cost as much or more than the Pro 750? Are there less expensive components in the Ascent series? Are there Vitamix pro 300’s with pitchers that aren’t made from BPA free plastic? Should one avoid the Vitamix pro 300 in cream white for example, for that reason? All of Vitamix containers are made with the same Eastman Tritan BPA free plastic. Vitamix has said they have tested other materials but haven’t found a glass or stainless steel design that meets their performance/safety requirements. Some Vitamix users have fitted a Waring Stainless steel container on a Vitamix 750/Pro 300(see this comment) with no issues but I haven’t tried this container. The Waring jar doesn’t sit completely flush on some Vitamix models so some consumers will also buy an inexpensive Vitamix 15578 rubber pad(see link) so that the Waring jar sits flush on the C and G series Vitamix blenders(and allows full contact with the Vitamix motor’s drive shaft). Be aware that using a Non-vitamix container on a Vitamix blender could void your vitamix warranty. Thank you for thei website Anna. I was very confused on which Vitamix to purchase. After reading your analysis I made the correct purchase for me the 750. I would much rather have the glass container than plastic for all Food containers. Maybe one day for Vitamix. Thanks Helen for the comment and glad you found our guide helpful. A lot of people would like Glass but Vitamix keeps syaign they haven’t found another material besides the current Tritan plastic that they currently use that holds up in their safety test standards. Some people retrofit a Waring Stainless steel blending container on the Vitamix blenders and it works. For the Vitamix 750, you would use the Waring container(here it is on Amazon) in conjunction with the Vitamix 15578 centering pad so it sits flush. I know a couple of features introduced with the Vitamix G series was better cooling and noise dampening. Are those features carried through in the Ascent series? Hi Yolande, yes the G series and Ascent has the same performance and noise levels. Both are slightly quieter than the classic models. The Ascent series just adds in the newest technology(smart jars, inter-connectivity with app), slight design changes with jar and lid, and digital controls.